Feel the real trouble of being farmer with realistic physics. Look after your machines in backyard workshop, expand your activites to other farms, and take care of plants in greenhouses. All of this and much more in Farm Expert 2017! 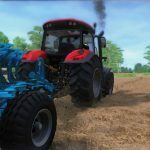 Previous story New screenshots of Farm Expert 2017 Tractors!